Schöne Beachfront Property in der stark nach Kite Beach gesucht entfernt. Sie werden absolut haben den Urlaub auf Ihre Träume in dieser bequeme, luxuriöse und moderne Wohnung. Durch enthalten Blick von jedem Teil der Wohnung umgeben. Nur wenige Schritte von der Haustür, um die Füße in den Sand. Reichlich Aktivitäten nach Ihren Wünschen wie Yoga, Kitesurfen, Wellenreiten, Cross fit, internationale Restaurants oder einfach nur Faulenzen am Strand zu entsprechen. Es gibt für jeden etwas. Wir freuen uns auf Ihren Besuch! Einzelteile wie Provate Chef, Staff, Concierge Dienstleistungen alle verfügbar für zusätzliche Preise und können durch Vor-Ort-Manager nach Bestätigung der Reservierungen arrangiert werden. Besser geht es nicht. Sicher, sauber, freundlich. Zu jeder Zeit. Top. Immer wieder. The view from the third floor of this delightful place is to die for. Ocean breezes blew constantly to keep us cool and the waves were our soundtrack. Our purpose was to take kiteboarding lessons and we found easy access to at least a dozen different schools. Surfing at Encuentro Beach required a taxi ride. Getting to the grocery is a long walk on the beach or a short taxi ride. Venturing out is always a taxi ride to the destination. Staff is helpful, friendly and delightful. Would not hesitate to stay again! My husband and I stayed for 1 week in late October 2018 at this beautiful updated condo. The unobstructed views of kite beach are the best in the area. The condo was furnished with everything needed to make our stay very enjoyable. This was our first time in the DR. The property manager, Kathy, was always available to assist with excursions, arranging drivers, etc. She was so helpful in making sure our trip was the best. Thank you Kathy. We highly recommend staying here!! We spent a week at this great Condo on Kite Beach. Located on the third floor, it has amazing views overlooking the beach and you get to see all the kite surfers! The condo had everything we needed. It was in a safe location and everyone there was very nice. We just spent another 2 great months in this cosy condo for the third year in a row. It says it all. See our previous ratings. It gets better every year. Kathy, the administrator goes out of her way to make our stay comfortable. Holly the owner is concerned and considerate, Dominga the cleaning lady is a real friend, the grounds are meticulously groomed by Paolino. This a nice spot at the end of Cabarete where it is quiet with a great view on Kite beach and it daily spectacle. It is not the Caribbean but the Atlantic but with all it's charms and occasionally calm waters. A very nice 6km walk on a beautiful sandy beach interrupted by a swim are part of the daily routine. Highly recommended. We have reserved our 2 months for next year. This condo is located o the 3rd floor with unobstructed views from the front balcony and master bedroom. Most of our "indoor" time was spent on the balcony where it is tee shirt warm even in the evenings and a very pleasant spot for meals. You are supplied with a nicely appointed kitchen and a gas grill so you can split your time between the local restaurants and eating in. Both bedrooms are very large with ample closets. All windows and doors are screened so mosquito and bugs are not a problem. I must add though during our stay there weren't any mosquito or bugs even on the open balcony. The condo group hires a full time gardener to maintain the beautiful gardens that surround the building and the pool. There are numerous places to lounge outside to read or nap and escape your normal life. Kathy, the property manager, is a gem in herself. She knows of all the local sights and excursions and can book whatever you wish for you. My wife had a medical incident and Kathy was invaluable with her advise and guidance. Having Kathy's phone number is reason enough to book here versus other condos. The restaurants in Caberete are a mile walk on the beach. We found it delightful to walk into town for the evening then take a taxi home for $300 RD, about $6 US. No need for a car. 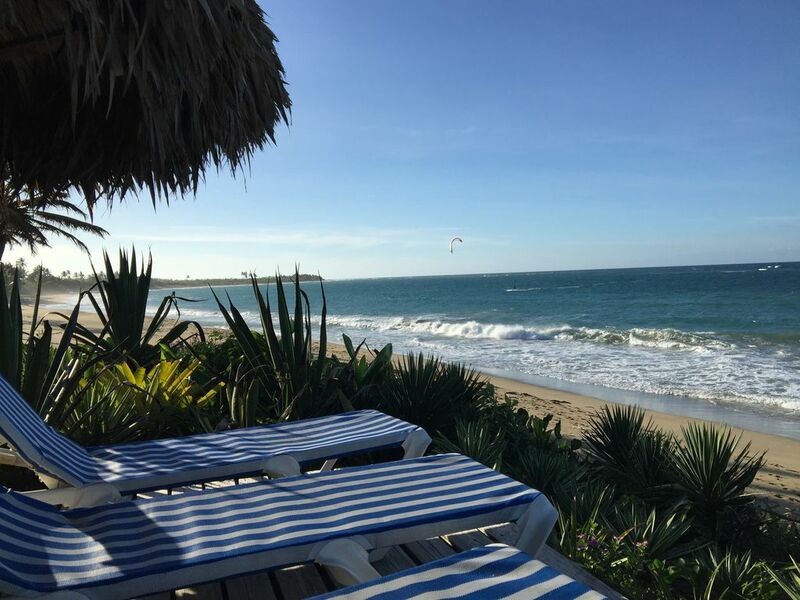 A wonderful getaway and if you are a kiteboarder, the launch beach is right at your doorstep. Winds in January typically are blowing at 2pm until sunset. I highly recommend this property.